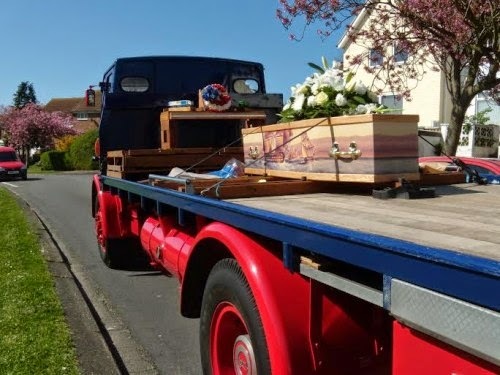 Vintage Lorry Funerals sent a marketing pack to Mother & Daughter Funerals in Hove on March 10th 2014 and it generated a funeral on April 9th, a record timescale response to a marketing pack, less than 4 weeks! 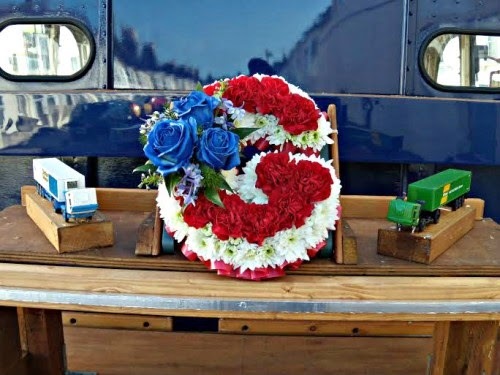 The Deceased had been an avid collector of model lorries so David Hall offered to position two of his own models either side of the Family’s ‘G’ Floral Tribute. The design for the layout had been signed off by the Brighton Family and the support structure was built during Wednesday and Thursday April 2nd & 3rd respectively. On Friday April 5th David was having a break, reading his paper, reflecting that all the preparation work for the Brighton funeral had been completed, when the telephone rang. A Lady apologised for the late notice, however, she wondered if Vintage Lorry Funerals could help her. The funeral arrangements for her Father had been finalised but she wanted to do more for her Dad, who had stated that he didn’t want his final journey to be in a black hearse. Her Dad had been a Fireman until his retirement when he set up business as a Landscape Gardener. She had made enquiries regarding a Fire Engine to carry the coffin, however, these phone calls had proved fruitless. 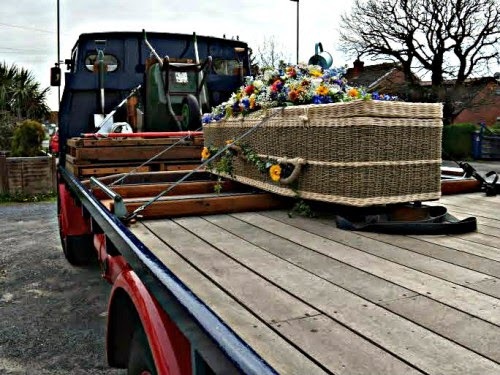 The Lady explained how she had looked at the Vintage Lorry Funerals website and noticed that David had previously carried a Lawn Mower in front of the coffin and she enquired as to what David could do for a Landscape Gardener. David has experienced similar conversations in the past 12 years and often Families tell him what they think they need, however, the skill is to channel their desires into something he can achieve within the tight timescales. What happened next resembled Bruce Forsyth’s Generation Game, from the 1970’s, in which contestants tried to remember items that they had seen pass before their eyes. The Lady said, ‘A Wheel Barrow, a Spade, a Shovel, Tree Cutting Equipment…..’ David was tempted to say, ‘A cuddly toy’ but he didn’t. It was agreed that David would gather together relevant tools from people near his home in Bradford-on-Avon and assemble the load the day before the funeral. David always works on the premise that if the design stays in place from Bradford-on-Avon to the Funeral Directors, it will stay in place from the Funeral Directors to the Crematorium. David made a series of phone calls to his support network and identified a number of options for equipment that could be lent to him for this funeral. In order to ensure that the tools could be loaded and held securely, David decided to dissemble the Brighton display that was in place on the lorry and erect the Landscape Gardener’s Theme during Saturday April 6th and Sunday morning April 7th. If all went well, during Sunday afternoon, the Landscape Gardener’s Theme would be documented, dissembled and put aside, with each tool assigned specific securement facilities, ready to reload on Thursday April 10th. Then the Brighton support structure would be put back in place and David would be back to where he was before the phone call about the Portchester funeral. On Saturday mornings some members of the Vintage Lorry Funerals support team come to David’s garage for their coffee and cakes, provided by his wife. These retired gentlemen have engineering backgrounds and their advice has proved invaluable when major themes are being created. 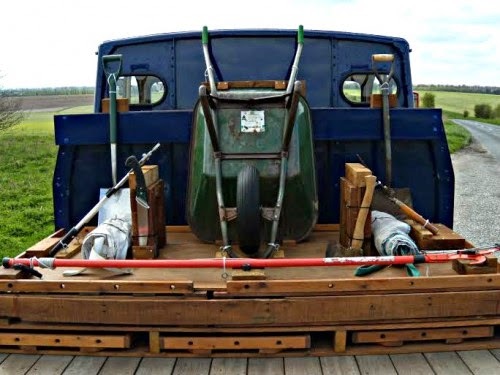 The centrepiece of the display was the Wheel Barrow and a novel securement technique was devised using small pieces of angled wood. Securement of the Spade and Shovel provided the biggest challenge and one of the old guys joked, ‘It won’t be any good if the Spade flew off in a Town Centre, creating next week’s business for a Funeral Director.’ One of David’s neighbours knocked on the garage door and offered her new Wheel Barrow, however, David explained that the look he was attempting to create involved tools appearing to have just completed their last job. Jim Pethers, Landscape Gardener, arrived on Saturday afternoon and gave David the option of various tools. The final selection was made related to which items were of a similar height, to create a balanced design, and which items wouldn’t mysteriously disappear when David stopped for a comfort break at Sutton Scotney Services. So Jim left with the Chain Saw and petrol powered Tree Cutters still in his van. The Landscape Gardener’s Theme was sketched and the Deceased’s Daughter was delighted with the layout and the price. When she suggested to David to round the price to the nearest hundred, she meant round up not down, as many other people may have done. The Brighton funeral worked well as David had organised undercover storage for the 1950 Leyland Beaver less than a mile from the Funeral Directors. David exceeded the expectations of the Family by tilting the cabs of his two model lorries as the coffin was discharged from the lorry at The Downs Crematorium. The lorry arrived home at 2030 hours and David’s wife started to clean the vehicle’s cab, immediately it was stationary. On Thursday April 10th David loaded and secured the tools with a mixture of wooden wedges and cable ties. David would be interested to hear from you regarding an estimate of the number of cable ties that were used in the Landscape Gardener’s Theme. I had my first ride in a 1950 Leyland Beaver when I was 5, in 1958. It is an honour and a privilege to take a Loved One on their final journey using my Leyland Beaver. When I'm travelling around the UK some amazing things happen and often facts may appear stranger than fiction, as you will see in these articles.